construction. Leather gusset reinforces zipper. loops for comb, toothbrush, or other accessories. 20% Fed. Exe. Tax included. Shpg. wt., 1 lb. 6 oz. 3-inch size. Shpg. wt., 10 oz. handle. Nameplate holder. Wt., 1 lb. 4 oz. made like bag above. Shpg. wt., 2 lbs. that will give many years of satisfactory service. 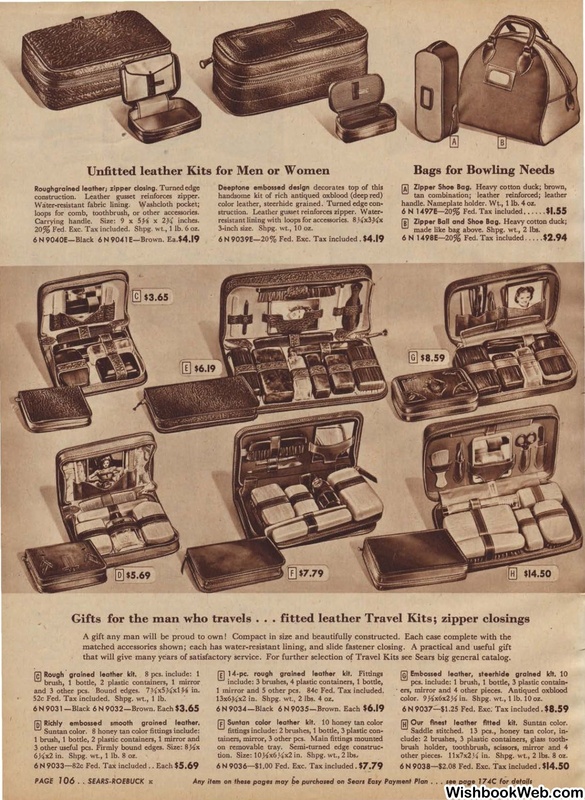 For further selection of Travel Kits see Sears big general catalog. and 3 other. pcs. Bound edges. 7Xx5Xx1U in. 52c Fed. Tax included. Shpg. wt., 1 lb. Richly embossed smooth grained leather. 6Y.x2 in. Shpg. wt., 1 lb. 8 oz. 1 mirror arid 5 other pcs. 84c Fed. Tax included. 13x6y.lx2 in. Shpg. wt., 2 lbs. 4 oz. cplor. 9,%'x6x2Y, in. Shpg. wt., 1 lb. 10 oz. Our flnest leather fltted kit. Suntan color. other pieces. 11x7x2,'v.\ in. Shpg..wt., 2 lbs. 8 oz.